"And their dead bodies shall lie in the street of the great city, which spiritually is called Sodom and Egypt, where also our Lord was crucified. (Rev 11:8)"
Next: Trumpet #7 sounds (Rev 11:15) and “in a moment, in the twinkling of an eye” true Christians will be resurrected and raptured (1 Cor 15:51-52 & 1 Thes 4:13-18). Why does the Book of Revelation reveal these three names (see above) for Jerusalem? I believe God is showing us that the Great City of Jerusalem is about to receive the same fate as Sodom and Egypt. These desolations were different than others! Why? Because these were utter desolations performed directly from God’s hand, this is “God’s wrath” not man’s or Satan’s! "Egypt shall be a desolation... (Joe 3:19)"
"O thou daughter dwelling in Egypt, furnish thyself to go into captivity: for Noph [capital city of Egypt] shall be waste and desolate without an inhabitant. (Jer 46:19)"
"Therefore thus saith the Lord GOD; Behold, I will bring a sword upon thee, and cut off man and beast out of thee. And the land of Egypt shall be desolate and waste; and they shall know that I am the LORD...(Eze 29:8-9)"
"Behold, therefore I am against thee, and against thy rivers, and I will make the land of Egypt utterly waste and desolate, from the tower of Syene even unto the border of Ethiopia. (Eze 29:10)"
"…I will make the land of Egypt desolate... (Eze 29:12)"
"And Lot lifted up his eyes, and beheld all the plain of Jordan, that it was well watered every where, before the LORD destroyed Sodom and Gomorrah, even as the garden of the LORD, like the land of Egypt, as thou comest unto Zoar. (Gen 13:10)"
"Then the LORD rained upon Sodom and upon Gomorrah brimstone and fire from the LORD out of heaven; And he overthrew those cities, and all the plain, and all the inhabitants of the cities, and that which grew upon the ground. (Gen 19:24-25)"
At the end of the great tribulation, during the sounding of the last trump, God's wrath will be poured out upon the Earth. A careful reading of Daniel 9:27 reveals that an absolute desolation of Jerusalem will occur by the hand of “Messiah the Prince” (Jesus). "When ye therefore shall see the abomination of desolation, spoken of by Daniel the prophet, stand in the holy place, (whoso readeth, let him understand:) Then let them which be in Judaea flee into the mountains: (Mat 24:15-16)"
"But when ye shall see the abomination of desolation, spoken of by Daniel the prophet, standing where it ought not, (let him that readeth understand,) then let them that be in Judaea flee to the mountains: (Mar 13:14)"
"And when ye shall see Jerusalem compassed with armies, then know that the desolation thereof is nigh. Then let them which are in Judaea flee to the mountains; (Luk 21:20-21)"
Jesus told us “the days will come, in the which there shall not be left one stone upon another, that shall not be thrown down” of the Jerusalem temple. 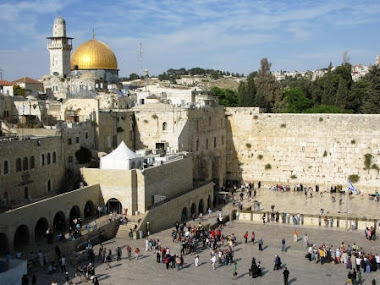 The Wailing Wall still stands today. Once this first desolation of Jerusalem occurs, Daniel 8:13-14 reveals that there will be a 2300 day time between the Abomination of Desolation and God’s final annihilation. This means that the Abomination of Desolation occurs about 8 1/2 months after the start of the final seven years. During the 2300 days the Antichrist, together with religious Jews, will be at work rebuilding another Jerusalem temple. "The sceptre shall not depart from Judah, nor a lawgiver from between his feet [Judah’s posterity], until Shiloh [Jesus the King] come; and unto him shall the gathering of the people be (Gen 49:10)." "...in the latter days... there shall come a Star out of Jacob [Jesus The Christ/Messiah], and a Sceptre [Jesus The King] shall rise out of Israel, and shall smite the corners of Moab, and destroy all the children of Sheth. And Edom shall be a possession, Seir also shall be a possession for his enemies; and Israel shall do valiantly. Out of Jacob shall come He that shall have dominion, and shall destroy him that remaineth of the city (Num 24:14-19)."